Sweet Jeanette: I HEART QUILTS! Did I ever make mention of my passion for quilts? 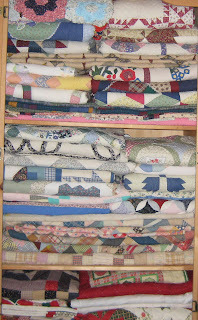 Which is quite odd for me to collect SO MANY quilts, being that I live in Florida. LOL. I used to joke that I'm ready for a nuclear winter, but with the winter we've had this year, I'm just happy to be ready now! These are not "my" quilts. I shot these on a quilt show trip with may aunt and cousin. I wish I could find a story I read in Country Woman magazine a long time ago.... it was about an avid quilt collector's recollection of responding to an ad an elderly lady had put in the paper She was selling her award winning quilt collections. The quilts were all plain, no fancy stitchery, or special appliques. The story went on to explain the reason for the awards and blue ribbons, and grand champion ribbons were that each quilt had a special story...a history behind them. They were special because of the love that prompted each block. I probably butchered the story, but that's what I got from it. It was a beautiful story and if I ever find it, I'll share it. Or if you have it, know where to find it again, please let me know! Have a great Sunday...and be sweet! Wow! I love quilts too and am in awe at your collection! I have two that my great grandmother made. One she made me when I was little and it is very heavy, not too sure it is a *quilt* but that's what I call it... and the other one she gave me about 10 or 11 years ago. She doesn't quilt anymore, she turned 101 last August and hasn't been able to quilt in a very long time. But you can bet I treasure her blankets! I LOVE quilts too! And thanks to YOU, I have my first one!!! I can't even imagine the time, care and skill that goes into making a quilt. Awesome! Hey you and your quilts! Sent you an award today!! Wow, that is a lot of quilts. I'm visiting your blog from the lady blogger's tea party. I'm also checking out your freezer friday posts. The pictures from the quilt show were yummy. If I go to a fair or anything, I make sure to go see the quilts, too :). Being a quilter, I also love quilts. Loved your little quilt show. Someone from my church made a quilt for my son before he was born. It has a cowboy theme. Sooo cute. I love quilts too. However, I do not have a collection, nor can I make them. I absolutely love your blog and quilts although I have never made one...I would like to someday...if someday ever gets here. I am now a Follower/fan/stalker...love it! Come on by http://shananagins2468.blogspot.com I would be honored to have you peruse my humble blog! Your quilts are very pretty! You sure have a LOT! I like quilts. First, LOVE the blog. Second, your quilting is amazing. Do you ever sell them? I'd buy one in a heartbeat. Maybe I missed you saying that in there, I got pulled away halfway down your page & when I came back in the cat had laid on my mouse! (Cat/Mouse?) ;) Have a blessed day! I know it's awesome being featured!! You have beautiful quilts!! I'm just learning how to quilt right now. Wow, that's some collection. I love quilting but I'm not great at it. I do keep trying. Right now I'm battling with learning how to bind. What a mess I've made! I am just getting into quilting, and I love that you have such a huge collection! My grandmother quilted, and my mom does now, and now she is passing the bug onto me. I also LOVE that sunflower quilt. I wish I could make something like that for my mom - we are from Kansas and she loves sunflowers!